[ Weeden Butler, cleric, author and schoolmaster. ] Autograph Letter Signed ('Weeden Butler') to Messrs Nichols and Son, printers and publishers of the Gentleman's Magazine, asking whether they intend to publish a review he has sent them. 1p., 8vo. Bifolium addressed on reverse of second leaf to 'Messrs: Nichols & son, | No. 26, | Parliament Street, | Westminster.' (Delivered by hand, with word 'Wait.' at bottom left of address.) In fair condition, lightly aged. 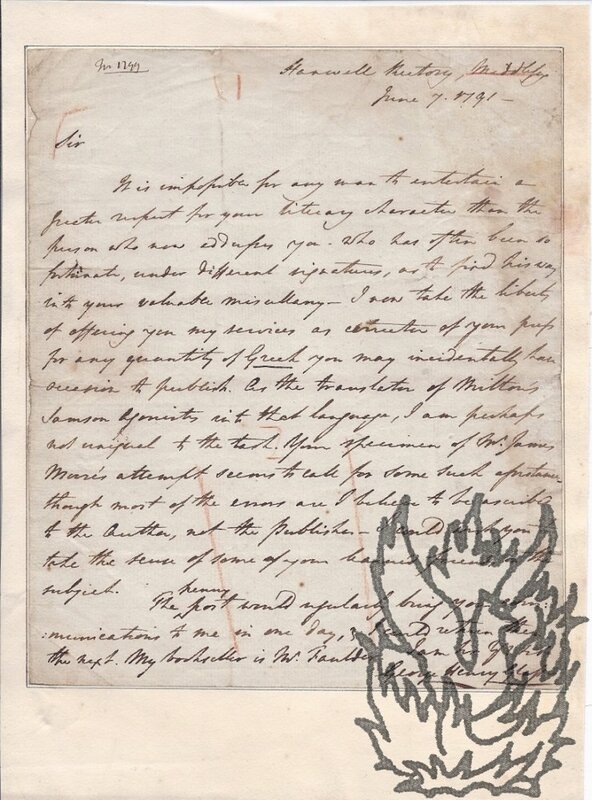 Written in a bold hand, the letter reads: 'Gentlemen, | I lately sent you by post a careful review of Baron D'Ordre's “Exiles of Parga,” & offered to correct a proof for you. Have you any intention to print the same? [ William Curtis, Tory politician and banker who coined the phrase 'the three Rs'. ] 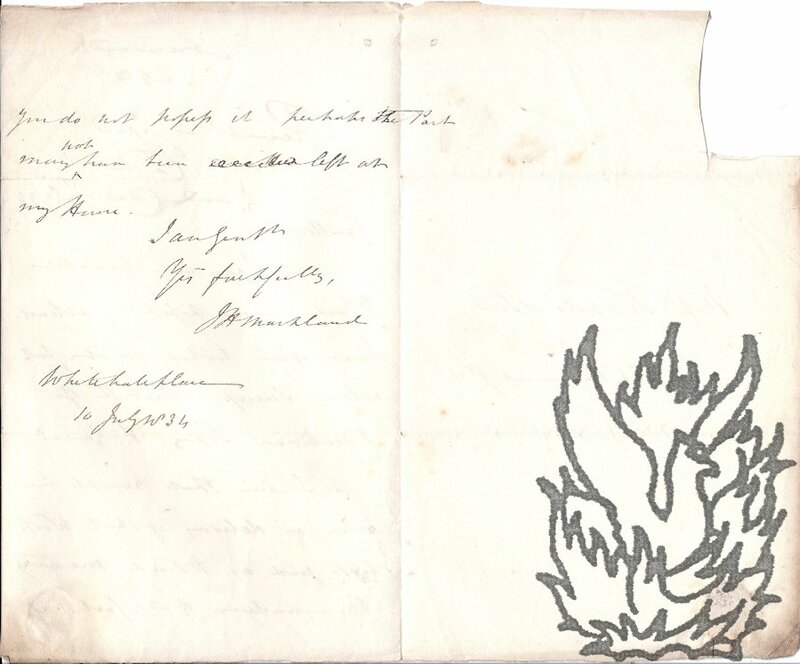 Autograph Letter in the third person to 'his friends Mess Nichols & Son' [ i.e. John Nichols and John Bowyer Nichols ], conveying directions for bookbinding. Lombard Street [ London ]. 9 April 1823. 1p., 12mo. Bifolium. In fair condition, aged and worn. Frank on reverse of damaged second leaf to 'Mess Nichols & Son | Parliament Street | Printers | W Curtis'. Seventeen lines of directions to ' his friends Mess Nichols & Son', regarding the binding of legislative works, beginning with 'two Statute books of Geo the Fourth'. Regarding 'an odd, abridgment of some of Geo 3d' he writes: 'it is probable there may be more, if so begs Mess N & Son would get them & bind them, if not it will hardly be worth the expense of binding the one'. [Printed pamphlet by the Society of Art Masters, London.] Paris Exhibition, 1900. International Congresses On Instruction in Drawing. Special Report prepared for the Society of Art Masters. London: Printed by J. B. Nichols & Sons, Parliament Mansions, Orchard Street, Victoria Street. 1901. 16pp., 8vo. Stitched. In grey printed wraps. In fair condition, on lightly-aged paper, with creasing to wraps and front cover crossed through in red ink. Shelfmarks, stamp and label of the Board of Education Reference Library, London. Scarce: no copies on COPAC or OCLC WorldCat. [Printed pamphlet.] All are Living: A Discourse in proof of the Doctrine, That the Soul while separated from the Body is consciously alive. Preached at Liverpool-Road Chapel, Islington, [...] On [...] the Death of Anne, Wife of the Rev. Dr. Beecham. 24pp., 12mo. Without wraps and disbound. In fair condition, on lightly-aged paper, with first and last page rather dusty. The word 'Methodist' written in pencil at head of title-page. Full title reads: 'All are Living: A Discourse in proof of the Doctrine, That the Soul while separated from the Body is consciously alive. Preached at Liverpool-Road Chapel, Islington, on Sunday, February 20th, 1853, On occasion of the Death of Anne, Wife of the Rev. Dr. Album containing 53 original photographs, with captions, by William Nichols, Farm Bailiff at Felix Hall, the country house of Sir Thomas Burch Western. An evocative collection of photographs, in which, unusually, a Victorian servant has been allowed to make a record of his masters, their country house, and household. The 53 photographs are laid down on 17 leaves of a contemporary stitched 4to album. In fair condition, lightly-aged, and with the brown marbled wraps of the album detached and separated from one another. Three of the photographs are lacking from the album. 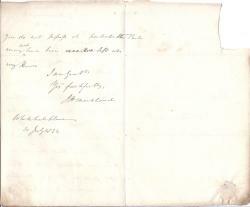 Autograph Letter, in the third person, from Lord Stafford [George Granville Leveson-Gower, 1st Duke of Sutherland and 2nd Marquis of Stafford] to 'Mr. Nichols' [John Bowyer Nichols], regarding a work by 'Mr. Dallaway'. 1p., 4to. Bifolium, addressed on reverse of second leaf by Stafford to 'Mr. Nichols | 25. Parliament St. | Westminster'. Very good, on lightly-aged paper, with seal cut away from second leaf and thin strip of stub along one edge. The letter reads: 'Lord Stafford received from the late Duke of Norfolk a Copy of Mr. Dallaway's work, & has since subscribed to one by Mr. Dallaway & Mr. Cartwright - if the volume referred to by Mr. Nichols is an additional work Lord Stafford will be happy to have it. | Ap. 27. 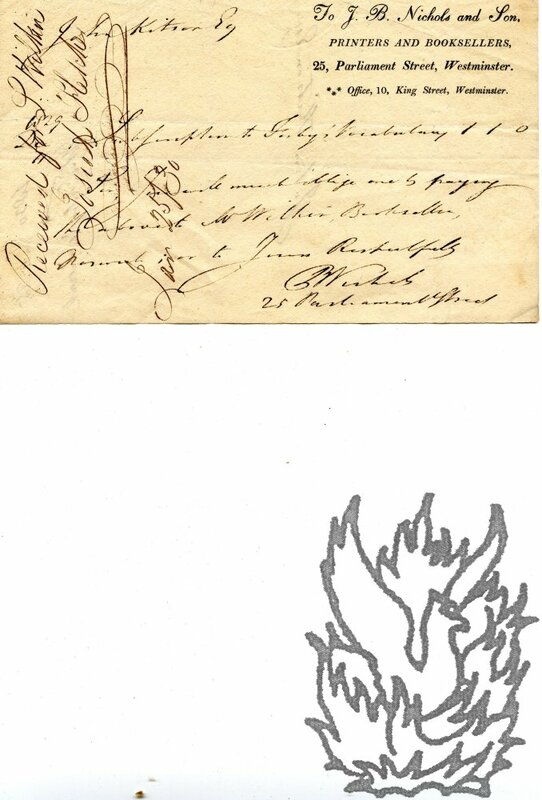 Eighteen Autograph Letters Signed from artist and poet Bowyer Nichols [John Bowyer Buchanan Nichols] to his aunt Emily Mary Nichols, daughter-in-law of John Bowyer Nichols, with dozens of sketches and caricatures in letters and on 27 pieces of paper. The letters mostly from Southgate House, Winchester (11), Eagle House, Wimbledon (4), Winchester College (2); dating from between 1871 and 1875. All items in good condition, on lightly-aged paper. The letters total 33pp., 12mo; and 31pp, 16mo; with nine on 12mo bifoliums, seven on 16mo bifoliums and two on single 16mo leaves. Nine are on Southgate House letterheads, and two on Winchester College letterheads. All are complete except the last, which lacks the last part. Mostly addressed to 'My dear Aunty' and signed in a variety of ways, from 'J. Bowyer B. Nichols' to 'BBN'. The first letter, dated 4 December 1871, sets the tone, showing Bowyer Nichols to be a precocious and spirited twelve-year-old. Autograph Letter Signed ('J Nichols') from the printer John Nichols, editor of the 'Gentleman's Magazine', to an unnamed male recipient. Place not stated. 26 July 1825. Autograph Letter Signed ('R: Griffiths') from Ralph Griffiths, editor of the Monthly Review, to an unnamed editor [John Nichols of the Gentleman's Magazine?] recommending the grandson of Dr Philip Doddridge. With engraving of Griffiths by Ridley. 'Turnham Green, June 13th.' [no year]. 1p., 4to. In good condition, on aged paper, with thin trace of glue from mount on blank reverse, and minor chipping beneath flourish of Griffiths's signature. Addressing his letter to 'Dear Sir! ', Griffiths suggests that if his correspondent is 'in want of any assistance' in carrying on his 'very extensive literary concerns, the Bearer can be well recommended. - He has had a liberal education, possesses a good taste, & may be useful to you in revising, correcting, translating, &c. &c.' The 'young Gentleman' to whom Griffiths refers is, he states, 'Grandson to the Celebrated Dr.
Autograph Letter Signed ('Wm. Salt') from the antiquary and book collector William Salt to the editor of the Gentleman's Magazine John Bowyer Nichols, making editorial comments and enclosing a list of 'Buckler's Engravings'. Sandgate, Kent; 11 August 1843. Letter: 2pp., 4to. 28 lines of text. List: 1p., on a 12mo strip. Both letter and list in very good condition, neatly placed in windowpane mounts on the two leaves of a bifolium. Salt is 'just finishing the List of Manuscript Erdeswick's' and will bring it to Nichols when he returns to London. He wonders whether Nichols has 'nearly come to the end of the Book in your reprint? I do not think you will make your first sheet answer satisfactorily - without printing the whole or part of it over again - but of course you will be the best judge of that'. Autograph Letter Signed ('George Henry Glasse') from the classical scholar Rev. George Henry Glasse [to the editor of the Gentleman's Magazine John Nichols], offering his services 'as corrector of your press for any quantity of Greek'. 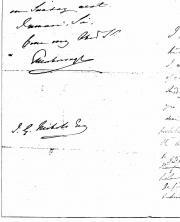 7 June 1791; Hanwell Rectory, Middlesex. 4to, 1 p. 18 lines of text. Clear and complete. Fair, on aged and lightly-stained paper. Neatly laid down on a leaf removed from an album. Lightly marked-up in red pencil by the recipient. After professing respect for Nichols's 'literary character' and his 'valuable miscellany', Glasse offers his services 'as corrector of your press for any quantity of Greek you may incidentally have occasion to publish'. 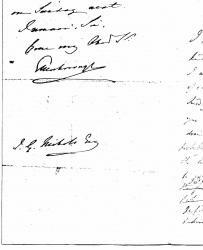 Whitehall Place; 10 July 1834. 12mo, 2 pp. Bifolium, addressed on reverse of second leaf. Fair, on aged paper. He does not think he received 'Part II of Collectanea Topog. & Geneal.' 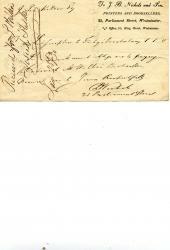 'As I believe that receipts are taken on delivery of that Work be so good as to send me any memorandum of the fact - if you do not possess it perhaps the Part may not have been left at my House'. Docketed, with details of the receipt, at head of first page. 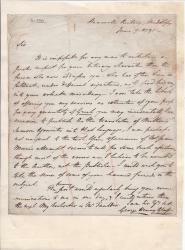 Autograph Letter Signed ('Ellenborough') with pencil draft of Nichols's reply. 17 November 1832; Southam House. 12mo bifolium. 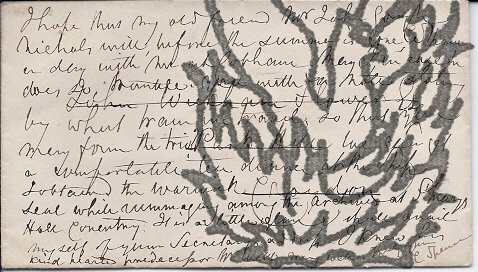 Ellenborough's letter (15 lines of text) occupies the first leaf; with the pencil draft of Gough's reply (also 15 lines), with additions and deletions, on the recto of the second leaf. Very good, with traces of grey paper mount adhering in a thin strip to the reverse of the second leaf. Ellenborough will 'afford' Nichols 'every facility for the making of tracings from the Tiles at Southam'. If Nichols will let him know when he is coming he will 'make it a point to be here'. Suggests that Nichols might come 'after Church, about 2 o'clock, on Sunday next'. Liverpool Fire Prevention. An Act For the better protection of Property in the Borough of Liverpool from Fire. [ROYAL ASSENT, AUGUST 24th 1843.] 6 Vict. - Sess. 1843. Folio: ii + 59 +  pp. Unbound. Stitched as issued. Text clear and entire, but in poor condition: on creased, discoloured and stained paper, with wear to extremities. Begins 'WHEREAS fires in warehouses in the borough of Liverpool have of late years been of frequent and alarming recurrence, and have been attended with considerable loss of life and property.' 124 clauses, followed by seven pages of 'Schedules referred to by the foregoing act'.